Police in Texas Pressuring Bars to Ban "Motorcycle Colors"
Cohen California establishes that individuals have the 1st Amendment right to wear clothing which displays writing or designs in public places. 12 The United States Supreme Court has long recognized and protected the right of an individual to freedom of association. Thus, a person’s right to wear the clothing of his choice, as well as his right to belong to any club or organization of his choice is constitutionally protected. SMPD’s policy recommendation represents a total ban on expressive conduct and is not based on a reasonable threat. The policy is far too broad to be considered reasonable. The policy is not specific to particular threats. 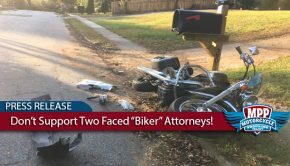 The over-reaching policy encompasses many people wearing motorcycle patches and colors and is therefore an unreasonable means of achieving a safe environment under the 1s Amendment. Associating with (or expressing association with) motorcycle clubs that government authorities label criminal organizations or gangs, is considered expressive conduct relating to an on-going public concern. 10See Schware v. Board of Bar Examiners, 353 U.S. 232, 238-39, 77 S.Ct. 752, 755-56, 1 L.Ed.2d 796 (1957); Chalmers v. City of Los Angeles, 762 F.2d 753, 757 (9th Cir.1985). 19City of San Diego v. Roe, 543 U.S. 77, 83-84 (2004) (per curiam). 24note on Godwin- Diﬀerent appellate circuits have traditionally handled unpublished opinions diﬀerently. Some circuits openly accept them, others do not. In 2006, a new rule was implemented under the Federal Rules of Appellate Procedure. Rule 32.1(a) is intended to replace these inconsistent standards with one uniform rule. Under Rule 32.1(a), a court of appeals may not prohibit a party from citing an unpublished opinion of a federal court for its persuasive value or for any other reason. Rule 32.1(a) applies only to unpublished opinions issued on or after January 1, 2007. 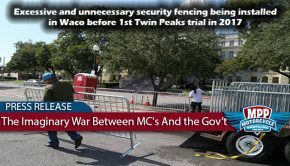 Having been a local biker, a resident of San Marcos and graduate of Texas state university, I have to say this prolific negative behaviour unto a society that media has condemned will solve nothing. These men and women have been in the area for years, as we all have. They just wear a patch now. Converse with them, then you’ll see. They’re all about community, their bikes and their loved ones. Even in the MC world, there is a hierarchy. If you’ve got a legitimate reason to complain for lewd behaviour as a business owner, speak with another patch holder. Be a human being, we all are. We just walk a different path then most. They’re idiots, and your letter is outstanding! To anyone expressing their opinion on the subject, DONT make it worse for the local clubs in San Marcos. Hate and four letter word filled communications can make hard to correct things,you are responsible for your own actions.The last thing needed is one damaging message passed on to the the local citizens.I am a biker who is also a citizen of San Marcos,I now plan to do my part in this issue,thank you, and Ride Safe. Great job Double D. Your efforts are greatly appreciated. Keep up the good work. 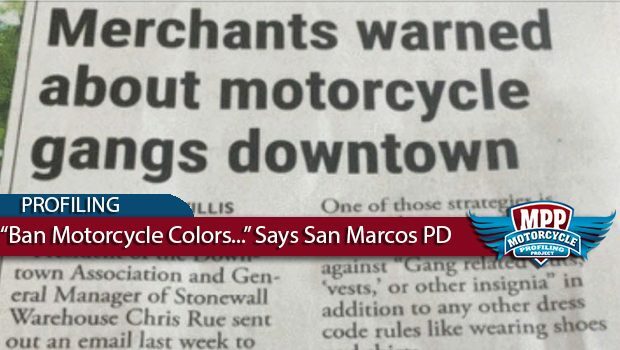 What makes the San Marcos PD discriminate against bikers. There are many MC’s, RC’s and Independent groups from every walk of life. Instead they want to make a law to put all bikers into “gangs”. This is far from the truth. We must stand up for our rights. Do you know how many bars and restaurants will lose business or close down ,all MC clubs should boycott all business that won’t allow colors or anything that has anything to do with clubs.